In the United States Navy, officers have various ranks. Equivalency between services is by pay grade. United States Navy commissioned officer ranks have two distinct sets of rank insignia: On dress uniform a series of stripes similar to Commonwealth naval ranks are worn; on service khaki, working uniforms (Navy Working Uniform [NWU], and coveralls), and special uniform situations (combat utilities, flight suits, and USMC uniforms when worn by Navy officers assigned or attached to USMC units), the rank insignia are similar to the equivalent rank in the US Army or US Air Force. W-1 for warrant officer one. Warrant officers appointed to this grade may be done via warrant or via commission. W-2 to W-5 for chief warrant officers. Chief warrant officers (CWO2 to CWO5) are appointed via commission. O-1 to O-10. Officers appointed to these grades are done via commission. O-1 through O-4 are junior officers: ensign, lieutenant (junior grade), lieutenant, and lieutenant commander. O-5 and O-6 are senior officers: commander and captain. O-7 through O-10 are flag officers: rear admiral (lower half) (one star), rear admiral (two star), vice admiral (three star), and admiral (four star). O-11 was the temporary flag officer rank of fleet admiral (five star). It was awarded to four officers during World War II, and has not been authorized since. However, the rank of fleet admiral of the United States Navy still remains listed on official rank insignia precedence charts and, if needed, this rank could be reestablished at the discretion of Congress and the President. All five-star officers are, technically, unable to retire from active duty. The last living fleet admiral of the United States Navy, Chester W. Nimitz, died in 1966. In the event that officers demonstrate superior performance and prove themselves capable of performing at the next higher pay grade, they are given an increase in pay grade. The official term for this process is a promotion. Commissioned naval officers originate from the United States Naval Academy, the United States Merchant Marine Academy, other Service Academies (United States Military Academy or United States Air Force Academy), Naval Reserve Officer Training Corps (NROTC), Officer Candidate School (OCS), the since-disestablished Aviation Officer Candidate School (AOCS), and a host of other commissioning programs such as the "Seaman to Admiral-21" program and the limited duty officer/chief warrant officer (LDO/CWO) selection program. There are also a small number of direct commissioned officers, primarily staff corps officers in the medical, dental, nurse, chaplain and judge advocate general career fields. Line officers (or officers of the line) derive their name from the 18th-century tactic of employing warships in a line of battle to take advantage of cannon on each side of the ship. These vessels were dubbed ships of the line and those who commanded them were likewise called "line officers." Today, all United States Navy unrestricted line and restricted line officers denote their status with a star located above their rank insignia on the sleeves of their dress blue uniforms and shoulder boards of their white uniforms; metal rank insignia devices on both collar-points of khaki shirts/blouses; and cloth equivalents on both collar-points of blue NWUs. Officers of the staff corps replace the star (or the left collar-point on applicable shirts/blouses) with different insignias to indicate their field of specialty. Line officers can be categorized into unrestricted and restricted communities. Unrestricted line officers (URL) the most visible and well-known of line officers, due to their role as the Navy's war-fighting command element. They receive training in weapons systems, tactics, strategy, command and control, and are considered unrestricted because they are authorized to command combatant ships, combat aviation squadrons/air groups/air wings, and special operations units at sea, or combat aviation squadrons/air groups/air wings or special operations units deployed ashore. Restricted line officers (RL) concentrate on non-combat related fields, which include marine engineering, aeronautical engineering, ship maintenance, aircraft maintenance, meteorology and oceanography, naval intelligence, information technology, manpower/human resources, public affairs, and a host of other career fields. They are not qualified to command combat units, but can command organizations in their respective specialized career fields. In certain shipboard environments, many unrestricted line officers fill what might be considered restricted line duties, such as the officers in a ship's or submarine's engineering department. Because they maintain their general surface warfare or submarine warfare specialist duties instead of completely specializing in one career area, they maintain their unrestricted line command career path. Staff corps officers are specialists in fields that are themselves professional careers and not exclusive to the military, for example health care, law, civil engineering and religion. There are eight staff corps: Medical Corps, Dental Corps, Nurse Corps, Medical Service Corps, Chaplain Corps, Navy Supply Corps, Judge Advocate General's Corps, and Civil Engineer Corps. They primarily exist to augment the line communities and are able to be assigned to both line and staff commands. One exception to this is the case of Civil Engineer Corps officers, who serve as the both Public Works Officers and Resident Officers in Charge of Construction (ROICC) at naval shore installations, and as officers for Construction Battalion (Seabee) units. This latter role requires them to serve in a command capacity for ground combatants when the Seabees are deployed to combat areas. Note 2: See also Commodore (United States) — today an honorific title (but not a pay grade) for selected URL captains (O-6) in major command of multiple subordinate operational units, and formerly a rank (O-7). Note 3: The term "line officer of the naval service" includes line officers of both the Navy and the Marine Corps. All U.S. Marine Corps officers are considered "of the line," including Marine Corps limited duty officers, chief warrant officers, and warrant officers, regardless of grade or specialty. The Act of Congress of March 4, 1925, provided for Navy, Marine Corps, and Coast Guard officers to be promoted one grade upon retirement, if they had been specially commended for performance of duty in actual combat, known as "tombstone promotions". Officers who received such tombstone promotions, or also known as "tombstone officer", carried the loftier title but did not draw the additional retirement pay of their higher rank. The Act of Congress of February 23, 1942, enabled promotions to three- and four-star grades. Promotions were subsequently restricted to citations issued before January 1, 1947, and finally eliminated altogether effective November 1, 1959. Any officer who served honorably in a grade while on active duty receives precedence on the retirement list over any "tombstone officers" of the same grade, while "tombstone officers" of the same grade rank among each other according to their dates of rank in their highest active duty grade. Navy officers serve either as a line officer or as a staff corps officer. Unrestricted Line (URL) and Restricted Line (RL) officers wear an embroidered gold star above their rank of the naval service dress uniform while staff corps officers, and chief warrant officers wear unique specialty devices. 1 An officer designator describes their general community or profession. The final (fourth) digit (X) denotes whether the officer has a regular (0), reserve (5), or full-time support (7) commission. The chief warrant officer and staff corps devices are also worn on the left collar of uniforms. U.S. Navy midshipman rank insignia can be found in the Midshipman article. 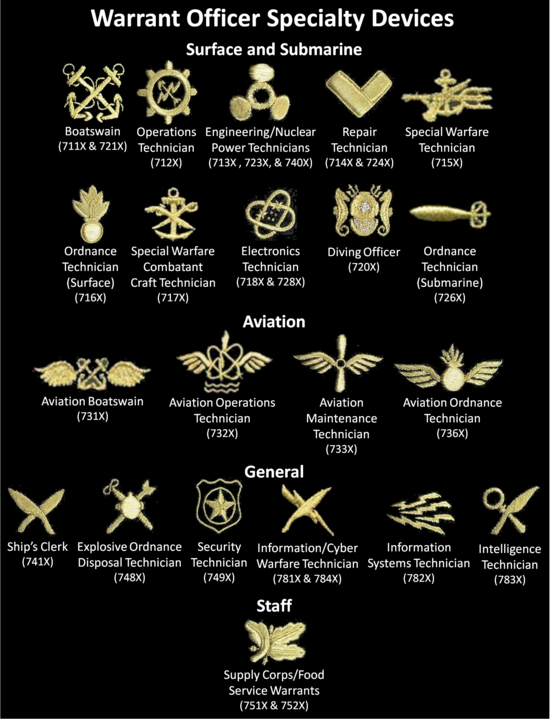 U.S. Navy warrant officer rank insignia can be found in the Warrant officer (United States) article. ^ Rank inactive (awarded to four officers[Note 1] during World War II, but not established as a permanent rank). ^ Rank inactive (awarded to Admiral George Dewey in 1903 [d. 1917], but not established as a permanent rank). The six star insignia is conjectural, as no Fleet Admirals were appointed while Admiral Dewey was alive. ^ a b 10 U.S. Code § 571. Warrant officers: grades, the President may grant appointments of warrant officers in the grade of W-1 via commission at any time and the Secretary of the Navy may also appointment warrant officers in that grade via commission, through additional regulations. ^ "Public Law 333, 79TH CONG., CHS. 109, 110, 112, MAR. 22, 23, 1946" (PDF). LegisWorks.org. Retrieved 15 September 2016. "This law in 1946 provided that each of the 8 Five-Star officers at the end of WWII was permanently appointed as O-11, and whether retired or not would continue to draw full pay and allowances for the rest of their life, as if on active duty. The same benefit was provided for the serving Commandants of the Marine Corps and Coast Guard (both O-10, 4-star General and Admiral, respectively), who were in office on 14 August 1945. No provisions were made for these officers' successors to have the same benefits; only one more O-11 was appointed, General Omar Bradley was appointed in 1950 as General of the Army, and his benefits followed the model of PL 333. The grade of O-11 itself was temporary in that while Congress provided for appointments to serve in it, once the last appointed officer (Bradley d. 1982) died, there have been no further appointments to O-11. ^ "Specialty Insignia - Staff Corps". ^ "United States Navy Regulations" (PDF). Retrieved 15 September 2016. ^ "14 United States Code 239 Repealed)". U.S. Govt. Printing Office. Retrieved 15 September 2016. Section 10(b) of Pub. L. 86–155 provided that repeal of this section and section 309 of this title shall become effective on Nov. 1, 1959. ^ "Navy Full-Time Support (FTS) Program". Navy.com. Retrieved 16 September 2016. Navy Full-Time Support (FTS) – This program allows Reservists to perform full-time Active Duty service in positions that support the training and administration of the Navy Reserve Force. Members receive the same pay, allowances and benefits as Active Duty members. One advantage of FTS over regular Active Duty is that members typically serve for longer periods at any assigned locations, up to and including a full career on active duty (albeit as a reservist serving on active duty for the specific purpose of providing support and expertise to integrate the active and reserve components. This page was last edited on 20 April 2019, at 13:50 (UTC).